Especially characteristic of wet sandy (to gravelly or marly) shores and moist flats between dunes along the Great Lakes and inland lakes, but also in marshy situations of all kinds, ditches, etc. 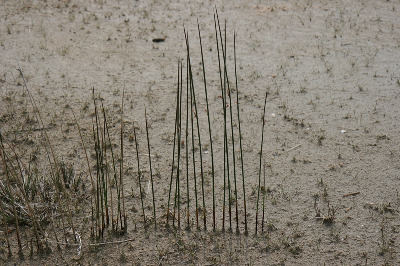 The straight rhizomes develop extensively in sand, with evenly spaced stems arising in conspicuous rows. Often subsumed into a broadly circumscribed Juncus arcticus, but we follow Snogerup, Zika, & Kirschner (2002) in keeping J. balticus distinct. Our plants are J. balticus subsp. littoralis (Engelm.) Snogerup. MICHIGAN FLORA ONLINE. A. A. Reznicek, E. G. Voss, & B. S. Walters. February 2011. University of Michigan. Web. April 21, 2019. https://michiganflora.net/species.aspx?id=1501.